Forest Rangers Day Camp is the foundation and frame of our summer program - where all of our campers have the opportunity to experience a summer camp that is safe and exciting. 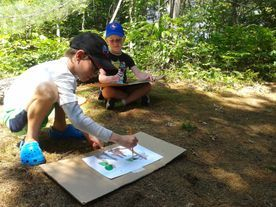 Our day camp focuses on providing children with fun, engaging play-based opportunities to learn and practice important friendship and social skills - while also participating in our unique outdoor educational programs. Facilitated by our team of experienced educators, every week features a special theme that shapes the focus of our games, stories & learning. Transportation available for Bracebridge (8am-5pm) & Gravenhurst (8:30am-4:30pm) and new this year - Washago & Orillia (sessions 1, 3, 6, & 7) !